The ministerium of the Evangelical Lutheran Synod has published a professional journal since 1940. Originally called the Clergy Bulletin, it was edited by pastors-at-large in the synod for many years until it was taken over by the faculty of BLTS. 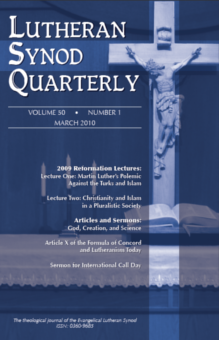 In 1961 the journal was renamed the Lutheran Synod Quarterly. In this section back issues of the Clergy Bulletin and the Lutheran Synod Quarterly are available to download.